When one reads him in the armchair one is transported to the ground and sees the game again in progress. We glance back even to Hambledon; we see the great giants of the time of “W.G.”; we have the game as it is on the village green as well as at Lord’s; and it is not only our sporting interest in cricket that Mr. Cardus quickens, but cricket’s great beauty and charm and humour. . . because it is the writing of a man who loves the game and whose touch is as delightful as his judgement is sound.. He could write so well that I have hardly ever read a notice of his, however brief and hasty, without something – it might be just a phrase – illuminating the page. When TP Bharathan (‘Ustadji’ to all of us at Delhi’s Madras Cricket Club in the 1960’s) first lent me his precious copy of a Cardus, heavily protected in a thick brown paper cover, and told me in the most threatening voice that gentlest of cricket coaches imaginable could muster, ‘If you lose or damage this book, I’ll kill you’, of course I knew the threat meant nothing. I did realize, however, as to how precious the thin volume was to this generous little man who had, for decades, given every single Rupee of what he saved (after providing for his very meager personal needs) and every single waking hour (other than the time spent at Air HQ in Delhi where he worked) to the game he loved so dearly. Ustadji gave freely and unthinkingly of himself to his wards and the game he tried to inculcate in their very being. However even his apparently unlimited generosity had its limits and it certainly stopped at this well-worn copy of The Summer Game. All the way home, I held the book close to my body, afraid to leave it in the bus as I did so often with my school books, deliberately to avoid doing my homework as per my sisters and due to the absent mindedness according to my mother. After a hurriedly wolfed meal, I rushed to my room ‘to finish my homework’. When my mother came to wake me up next morning I was still reading it using a torchlight under my quilt. I was already a cricket crazy teenager but on that night I fell head over heels in love with the game. That is the effect the prose of Neville Cardus had on tens of thousands of schoolboys around the world. On the elderly lovers of the game reading him, Cardus had a different affect; he turned them into schoolboys again. The schoolboy with his love for the game and undying devotion to his cricketing Gods was the central character of a lot of Cardus’s early writing even when not directly invoked by the writer. I suppose it was Cardus himself, a short sighted, grubby school boy at the turn of the last century, furtively sneaking a peek at the afternoon papers, scared that a full view might reveal that his beloved Spooner had fallen before lunch at Old Trafford. When you read. . .When I was not much more than a child I adored Victor Trumper. Indeed I found myself in a predicament. Patriotic as most small boys, I of course wanted England to beat Australia every time. But also I wanted Trumper to bat well in every innings. I got out of the dilemma by the most artful prayer ever delivered to Omnipotence. Please God, prayed this small boy that was once myself, Please make Victor Trumper score a century tomorrow-out of an Australian total of 120 all out. . . . you recall your own childhood prayers. It wasn’t difficult to replace England with India and have Norman O’Neill occupying Trumper’s place at the altar. When he died in 1975 Cardus was within less than a decade short of a century of his own but its unlikely that at heart he remained anything but a schoolboy where cricket was concerned. His love for the game was unalloyed – unadulterated, his devotion to his heroes, be they of Lancashire or England, was that of a Labrador to its master and his playful disdain for the enemy, mostly Aussies and Yorkshire men, as delightfully mixed with admiration as only a schoolboy is capable of conjuring up. However, to reduce his writings to the flights of fancy of a school boy who refused to grow up, as some of his latter day critics have tried to do, would be to do great injustice to the greatest of cricket writers and would expose us to charges of envy and worse. Cardus did much more than bring the schoolboy alive in all of us. One of the striking features of his writings was the amazingly vivid pictures he painted of the England of the times, the greens of the cricket grounds, the whites of the players walking down the pavilion steps and most of all the way in which he brought to life the characters of the game. Cardus took us along with him into touching distance of Wilfred Rhodes, George Hurst, Tom Richardson, George Gunn, Reggie Spooner and a host of others. He puts us in the time machine of his writings and transports us to the lands of yore and the characters that inhabit them. He makes us the invisible witnesses to the most intimate dialogue with and amongst the giants of an era gone past who he not just brought to life, almost in flesh and blood, but completed with the accents, dialogues, mannerisms and personality nuances. We can never thank him enough for that. People today struggle to appreciate the likes of “W.G.”, Spofforth, Ranji, Rhodes, Woolley, and Jessop etc. In the absence of television or any other type of visual media the modern fan is unable to go beyond reducing the feats of these giants of a century and more ago to merely a function of their statistics. Photographs are few and the films almost non-existent, cruelly short, black and white and jerky making the characters less than life like and caricatures of the all-conquering athletes they had been. This is in complete contrast to what media and technology is able to do to modern day sportsmen, providing us with a larger than life image which makes us believe that the difference between the giants of the modern day and those of a century ago are as great as the difference in the technology of the two eras. What Cardus helps to provides us with is an alternate view, a glimpse through his writings of the cricket fields of England and the giants that bestrode them and, for that, the least we can do is to be immensely grateful to him. Yet there have been writers, not fit enough to sharpen Cardus’s pencils or dry the ink on his manuscripts, who have seen it fit to run him down for ‘living in his imagination’. Of course Cardus took ‘poetic’ license, and I use the word poetic for his prose very deliberately when he fills in from his imagination, colours in the picture he is painting for us to make the experience so graphic and so vivid for us. This is his art, which is to be seen for being different from the run-of-the-mill craft the writers of our times struggle to churn out day after day. But instead of admiring the man’s art some have chosen to want to run down that which is most wondrous in his writings. It must have really hurt Cardus when, amidst half a century of undiluted admiration, murmurings were heard about his ‘inventing’ scenes and dialogues in his flights of fancy around the cricket fields of the world. He was finally driven to write in The Spectator in the mid-1970s when commenting on Christopher Martin Jenkins summing up of MCC’s tour of the Caribbean in 1974 when CMJ bemoaned the lack of characters in the game of the day, he wrote. . . I sympathise with him in his searching for characters in our first-class cricket at the moment. Frankly, I think they are there, present embryonically. Emmott Robinson, Rhodes and Herbert Sutcliffe, were not actually the rounded ‘characters’ looming large in my accounts of Lancashire versus Yorkshire matches. They provided me with merely the raw material, so to say; my histrionic pen provided the rest. I have often told, in print, of a wet morning at Leeds, a Yorkshire versus Lancashire match. The sun came forth hot and sumptuous. At half-past two Rhodes and Robinson went out to inspect the wicket, I with them. Rhodes pressed a finger into the soft turf, saying, “Emmott, it’ll be ‘sticky’ at four o’clock.” “No, Wilfred, half-past.” I put words into his mouth that God intended him to utter. He goes on to add in another place talking of the typical Yorkshire stodginess at the crease. I one day protested to Maurice Leyland, great Yorkshire batsman and representative Yorkshire man, that this sort of cricket was ‘killing the game’. “I’s all reight,” he assured me, “but what we need in Yorkshire-Lancashire matches is ‘no umpires’ – and fair cheatin’ all round.” Lancashire and Yorkshire batsmen, on being struck on the pads by the bowler, immediately withdrew legs away from the stumps, so that the umpire would be hard put to it to deliver a leg-before decision. We really don’t care Sir Neville; wish you hadn’t even brought it up. Another complaint that some modern writers have against Cardus and other great writers of earlier eras is that they live in the past; that they tend to glorify the heroes of their own youths and run down all those who came later. At the outset, let’s admit that this is true for almost all of us just lovers of the game or those that even attempt to write about it – it’s human tendency. Yet, an unbiased reading of his accounts (or those of others like him) reveals that in most cases the argument of ‘living in the past’ is not based on solid grounds. Sir Neville does make a mention of this tendency too when he writes. . . I am often told that I live my cricket in the past, enchantment of distance glorifying disproportionately cricketers in action decades ago. But let me see, today, Barry Richards at the wicket, or Kanhai, or Sobers, or Clive Lloyd or Kallicharan, to pick a few UN-English names, and I know I am watching cricketers so gifted in skills, as fascinating and personal as any exhibited by my heroes in the past. There. There it is in cold print but I wish it were just said in an interview or a casual chat. In print it looks as if someone of the stature of Cardus is being made to ‘defend’ his immortal writings and that hurts. Everyone who calls himself a student of the game, and is not lying through his teeth on one count or the other, has at least read one work of Cardus. For these readers and fans of Cardus it is not difficult to see that he does not run down modern day greats when he waxes lyrical of the giants of an earlier age. So what did we seek from him by way of explanation – surely not a forsaking of the memories of his youth, the disavowing of his childhood deities, a disowning of the heroes of his dreams? No one, not even a chronicler of history, and Cardus is only very partially that should not be put to such a tortuous dilemma of choice. So then what is it that the modern day scribes really dislike about Cardus? One really doesn’t know but one can try to make a guess. It’s probably no more than a tentative hypothesis but when something is a mystery to me, I tend to look within and seek an answer. I have read Cardus as a fifteen year old and still read him as I am on the threshold of being four times that blissful age. I do see him differently today particularly since I have started dabbling in putting pen to paper or rather finger to keyboard myself with cricket as my favourite subject. I have started seeing Cardus differently as I read him one more time. I love the words, the wordplay, the pen-portraits, the script of the plays his characters are performing and their dialogue. But I am also resentful. I am resentful because I wish, so very desperately, that those beautiful turns of phrase, those delightful analogies, and those spontaneous yet wonderfully evocative portraits that he paints with effortless flourishes of his pen had emanated from my keyboard. I once thought it was a good idea to publish a book of Cardus’s quotes (I might still do it one day) but I found, as I started making a list of them, that it would run into volumes. There is a sentence to underline every other line. Its almost as if the man’s entire body of work till the 1950s is worth quoting. I do not know if there are many writers in any sphere of whom the same might be true. That is what is special about John Frederick Neville Cardus. A very large number of eminent writers who followed him and did fabulous work have been criticised for copying Cardus. I am not sure the criticism is justified although the underlying message is valid. That Sir Neville influenced cricket writers who followed him is not surprising and many have indeed admitted to being greatly influenced by the master. We have to take the impact Sir Neville had on the writings of those who grew up reading him, as an unconscious acknowledgement of the influence his writings had on them and no more. It is an unintended compliment – the best as far as compliments go. I find it very interesting how one keeps coming across sentences that he wrote and find how beautifully they fit a character in the modern game. As I read. . . Jessop’s eyes and brain were always un-ruffled and discerning while he scattered far and wide, the best of balls, crashed them against sight screens, through windows of pavilions, into bottles of glasses and bars, on the roofs of houses in the vicinity. . . . I wonder why I did not write that when Afridi was scattering Indian bowling to all parts of the Green Park at Kanpur in 2005. When he wrote. . . If he was audacious, it was because audacity paid – offense was his best defense. He improvised strokes never seen before on the cricket field, but not out of the artist’s love of doing things in a different way, but because inimical circumstances could not be thrust aside by the old expedients. When he tried a fresh stroke he asked (himself) if it ‘worked’ not if it was ‘artistic’. We all recollect his slash stroke, that uppercut over the slips’ heads. It was not beautiful to see, but immensely fruitful of runs. Had it happened in an innings of Spooner it would have looked like a flaw in a delicate piece of porcelain. But how in keeping the stroke was with the punitive game of Tyldesley! Again take his off driving; he had no objections to lofting the ball as long as it was lofted profitably. 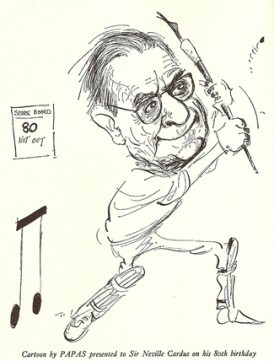 The batsman who is an artist before he is a cricketer has a fastidiousness, which is set all on edge, so to say, at the very sight of a stroke ‘off the carpet’. Tyldesley had no such compunctions.
. . . he was talking of Johnny Tyldesley and yet as I read the words again a few days ago, I asked myself why I couldn’t write that when I wrote a piece on Sehwag last month. It could so easily have been said of Sehwag that he was being audacious because audacity paid. I could have thought of the inimical circumstances that could not be thrust aside for old expedients or that similar batting coming from the blade of Laxman would have been like flaws in a delicate piece of porcelain? Why couldn’t I think of that? I really think I could have written it myself, but no, that’s not true. It just appears as if I could have written that. That is the hallmark of truly great writing. It always has that effect on those wanting to write. Then it depends upon them whether they recognise, in this unconscious compliment they are paying to the writer, an unsaid recognition of the art or, see in it ordinariness, bring him down to their own levels and attempt to run down his work. Fortunately for the cricket enthusiast, willing to know of the game, the players and the eras long gone, Cardus remains alive through his magnificent body of work. If only the books were as easy to come across on bookshelves in cricket playing countries as are the biographies and autobiographies of active cricketers that are, more often than not, not worth the price of the dustcover. Wonderful stuff, I enjoyed reading that very much. I have one book of his, an account of the Ashes series of 1936-37 – but I’ve been inspired to seek out some more. Robertson-Glasgow wrote in much the same vein, a Cardus fan would enjoy his work I think. Great read, Swaranjeet, thoroughly enjoyed it! Swaranjeet, I really appreciate your candour in admitting that you could have written about the modern day cricketeer, what Sir Cardus did in those days! This establishes your humility and passion for the game as well as appreciation of a great writer like Cardus. Unfortunately, we in India can only feel jealous of writers like Cardus , Maugham, James Joyce etc…lets face it , however we may be good in English, the real thoughts which comes to the original Englishmen, will never come to us, as English is after all a foreign language to us, and merely writing grammatically correct english is not sufficient, but it calls for a rich imagination in English language! Swaranjeet, wonderful article. I am also a great fan of Neville Cardus. However, I have always wondered that why his books are so expensive to buy. My point is he died in 1975 & the contents of his books are amost 75 years or more old. Why can’t his work be now freely available on Internet to read? I don’t know much about Copywrite laws… Still I wish his books were available at affordable prices.